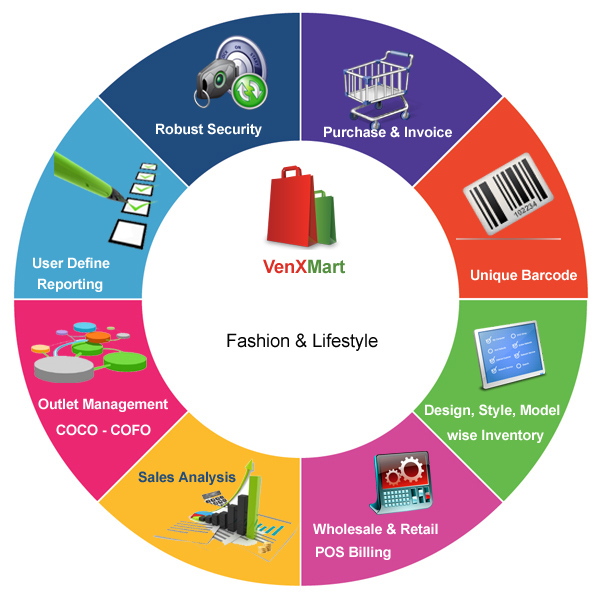 VenXMart is specialized in the fashion & life style industries. We have been providing software solutions for this particular industry. We form long term relationships with our clients. Uses the best function throughout the entire program. One-stop solution loaded with intelligent features such as unique barcoding, quick stock taking with handy terminals. It handles product age/type based sales staff incentive, rapid liquidation of non-moving stocks, calculation of accurate landing costs to fix margins etc. Turnover reports for vendor, city, and purchaser. Reports for barcoded invoices and pending invoices. Stock report for invoice with serial number. Automated alerts through mail or sms to top management. Automatic calculation of margins (mark up or mark down) at the time of price fixing. Complete track on Stock ageing. User can get the aged stock reports to apply the promotions. Barcode Solution for Bulk items like “Thans”. Central purchasing is available for warehouse management. Flexibility to add additional attributes to the product. Complete stock ledger and purchase history reports are available. Purchase return is also available for dead or damaged stock. Graphical representation for Stock movement analysis. User defined formats of barcode sticker. Supportability for different barcode printer manufacturers. Shortcut formats to retrieve barcode from item code. Barcode pickup from multiple rates wise. EANCode can be set for cosmetic items instead of taking barcodes. Multiple sets can be given at the time of printing. Like same barcode will print double time or triple time. Barcode search given if any barcode sticker lost. Barcode solution for bulk items like Thans etc. Barcode tracking for dead stock to give promotions. Restrict price changes that do not cross its cost value. Log reports for promotions and changing price. Style details on by scanning the barcode. Pickup of items by Model. Whole sale and retail sales analysis. Stock reports with whole sale value and retail values. Minimum sale qty can be declared for whole sale billing. Credit payment options for agents business. Every user will get separate username and password to use the software. User can change his own password at any time, and it is confidential. Role based security restricts users to access all parts of the software. Multiple Roles can be created in the software. Different level of users can be created on these roles. Example - Billing operator restricted to use only billing screen. He will not able to access any other parts of the software like stock reports etc. Module based security restricts users from different actions related same module. Different levels of permissions will be given for every module like “Read Permission”, “Add Permission” and “Full Permission”. Example- Stock Entry Operator can enter the stock into the software but he cannot modify the previous stock entries. Various log reports will provide you information about user actions on the software. If any enquiry is required in any situation these reports will be more helpful.